This is an Switchman w/Lighted Building Power-Loc(TM) Assembled Model Railroad Trackside Accessory in HO Scale from Life-Like Trains. Retail $24.98 SAVE 24% ! with glowing lantern. After last car passes, he goes inside. 9" section of track is contained within white, green, and brown shaded plastic landscaping. door, and sits upon a grey pad surrounded by a white picket fence. The switchman who comes out is dressed in blue and carries a red (non-functional) lantern. The middle of the piece is a black, two-lane road with a yellow stripe in the middle, and "RR XING" in yellow across each lane. The other side has a black pallet on the ground and across the tracks is another railroad crossing sign. Unique side-locking track system puts an end to rail joiners. boards, nails, screws, and other tools. Solid roadbed base offers durability and support on any surface. Assembled track will not bend, and can be picked up, hung on wall or stored under bed! 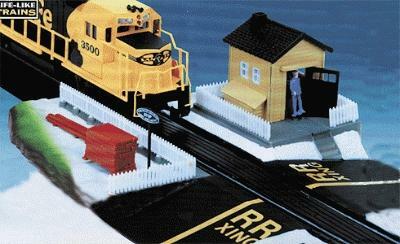 One HO Scale Switchman with Lighted Building. Works with all rail-joiner track when used with Power-Link Adapter Track #21314 (sold separately).